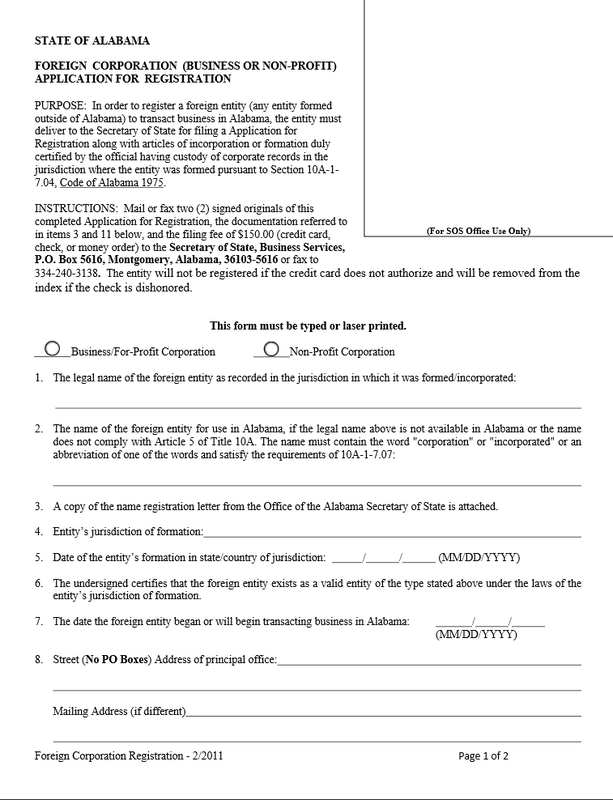 The Alabama Foreign Corporation (Business or NonProfit) Application for Registration is the form foreign entities, wishing to operate a for-profit or business corporation in Alabama, must submit to the Secretary of State. This should be done directly, by mail or fax, with a $150.00 state fee, an official name registration letter from the Alabama Secretary of State, and the certificate of formation from your entity’s original Secretary of State. It is important to note the name of the entity must comply with the Alabama State Code Title 10A Article 5. 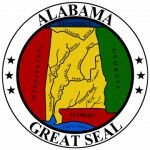 The name must be obtained through the Alabama secretary of State, for a small fee here: https://www.alabamainteractive.org/sos/welcome.action. Step 1 - On page one, fill in the bubble next to the words “Business/For Profit Corporaton” to indicate this foreign entity will operate with the intent to profit. Step 2 - In item 1, enter your foreign corporation’s full legal name as it appears in your original certificate of formation. Step 3 - In some cases, the name of your entity may not be available or comply with Code of Alabama Title 10A Article 5. If the name your entity operates under is different from that on your original certificate of formation, enter it in item 2. Step 4 - Next in item 4, enter the name of the jurisdiction your entity was formed within. Step 5 - The fifth item will require the date your corporation formed in its original jurisdiction to be entered. 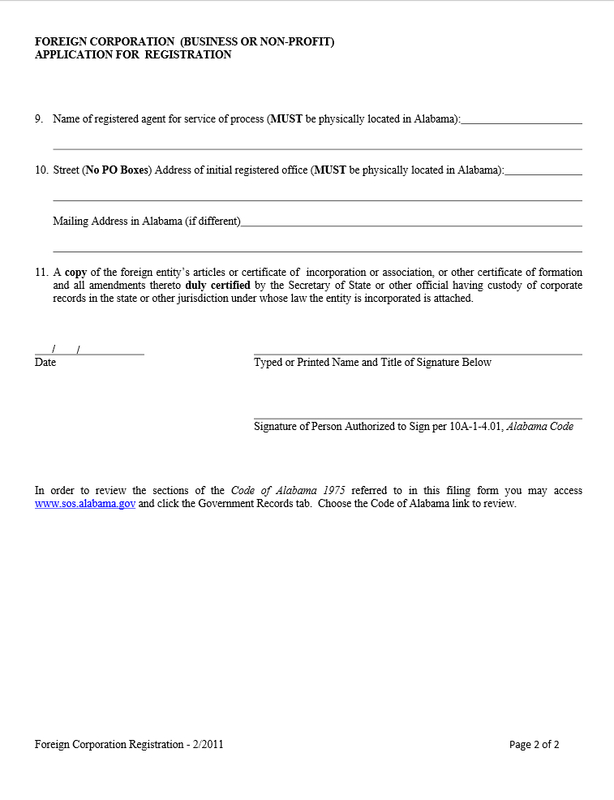 Step 6 - Enter the date you expect your entity to begin operating in the State of Alabama in the sixth item. Step 7 - Report the street address of your principal office in item 8, if the mailing address for your principal office is different from your principal office street address then report this in the space labeled “Mailing Address” as well. Step 8 - As a foreign entity, you must have a registered agent with a physical address in Alabama. Report the name of this agent in item 9. In the tenth item, enter the street address of this agent. If this agent has a different mailing address, this too should be reported in item 10 on the second page. 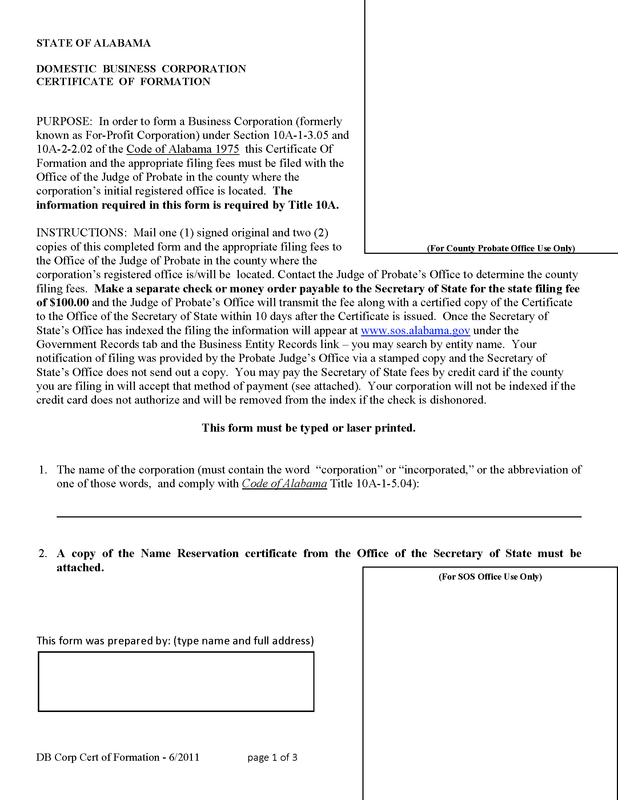 Step 9 - The individual who has filled out this certificate must conform to Alabama State Code 10-A-4.01. This individual must date and have his/her name printed. Then, this individual must sign this document. Step 10 - The final page gives an opportunity to pay the state fees by credit card. If this is the case, indicate the card type on the first line. 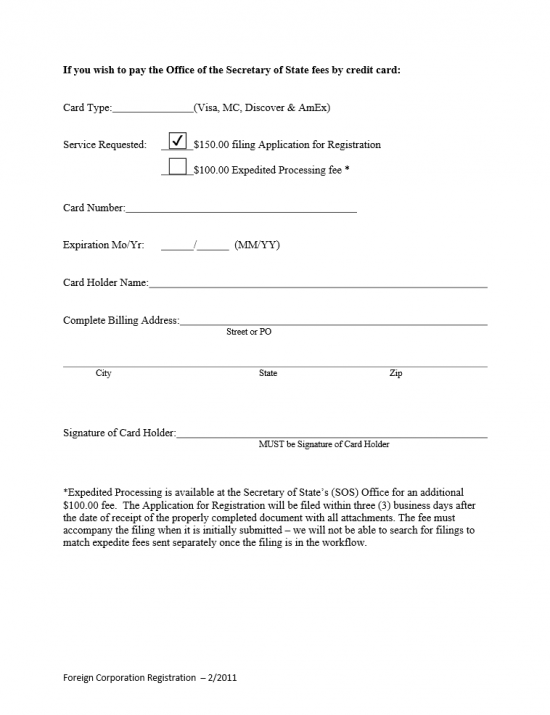 The “Service Requested” section must have the first box ($150.00 filing Application for Registration) marked off. If you would like to expedite this, you may also select the second box. Below this, enter the credit card number, credit card’s expiration date, the card holder’s full name as it appears on the card, and the billing address associated with the card. Once all this is done, the card holder may sign the bottom of this page to authorize the transaction.